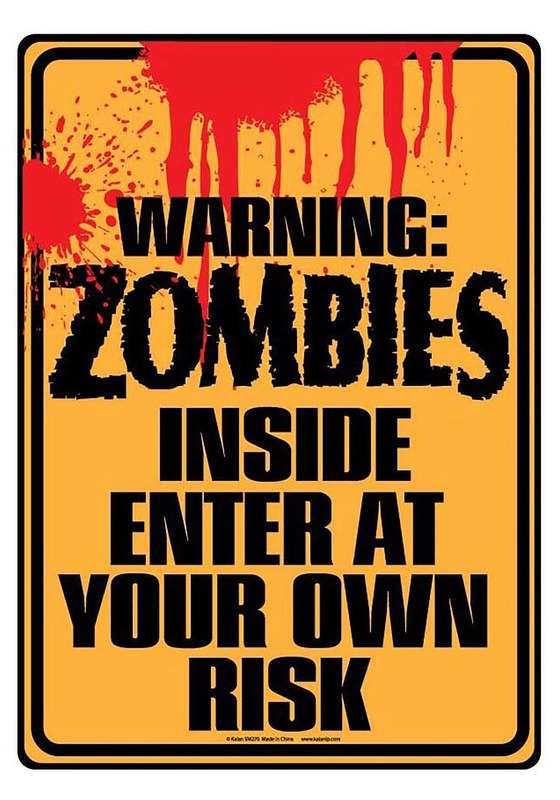 When you're a part of the zombie apocalypse, there are a few rules. Now, you don't have to put yourself in danger's way but you should certainly let people know that the house you just left behind is chock full of biters. When you're a survivor of the first wave of zombies, you've just got to take care of other survivors. Shut the door when you're leaving a threat-free zone behind. Pull the weeds away from that abandoned garden, it could feed someone in a couple months. And most of all, keep people posted! This bright yellow sign is hard to miss, perfect for letting people know that there is a zombie party going on behind this sign. There is a hole in each corner so you can mount it where ever you see fit. This is perfect for Halloween functions, game rooms, or zombie themed parties. And hey, if someone gets bit, at least you warned them! If you have a zombie fanatic living in your house, you might as well lean in. After all, if the big one does indeed happen, you need someone around who's thought of which household objects to use as a barricade and where to get canned goods besides the grocery store. As all zombie fans know, you never want to get caught at the grocery store!